Build Visualizations, User Interfaces, and Automation apps using Developer Tools and APIs, for .NET, web technologies, native iOS and Android mobile apps, and using a REST API for devices and applications on any platform. Developers can choose from components and libraries for creating visualization apps, headless data automations, or even automated configuration and deployment of OAS-based systems. The OAS Platform includes a wide variety of Developer Tools and APIs to allow you to create applications and system integrations to execute in any environment. .NET Developers have access to assemblies for creating data integrations, as well as visual controls for developing HMIs or User Interfaces in WinForms and WPF. There are even Portable Class Libraries (PCLs) to allow .NET developers to create native iOS and Android apps using Xamarin Forms. Developers can also automate the configuration of the OAS Platform itself. This allows system integrators to build applications which roll out new OAS installations, saving thousands of man-hours. Using Visual Studio and OAS visualization tools, .NET developers can build customized HMIs and integrate with existing Windows applications. All .NET Visualization tools are compatible with Visual Studio 2005 or later. Develop Windows Forms applications in .NET using either C# or VB.NET. Includes a wide variety of visual controls. Develop visually stunning WPF applications in .NET using C# or VB.NET along with XAML. Includes a wide variety of visual controls. Create real time and historical Trend visualizations, plotting multiple simultaneous data points. Interactive visual controls for analyzing and exporting data. View and manage real time and historical Alarms. 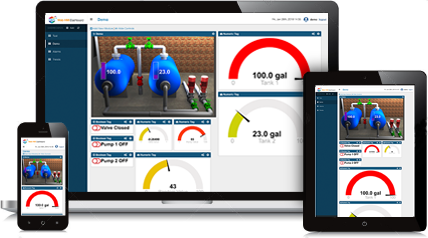 Interactive control allows users to acknowledge and comment on alarms, or filter based on any attribute. Develop web applications or integrate with existing web apps to display, modify, and control real time data in an OAS Service, all from within a desktop or mobile browser. Create real time and historical Trend visualizations, plotting multiple simultaneous data points displayed in any desktop or mobile browser. A pre-built web application allowing users to quickly visualize data without writing any code. Includes modules for tag, alarm, and trend visualization. One of the most powerful features of the OAS Platform is automation. Using our components and APIs, the OAS Universal Data Connector configuration itself can be automated. This allows for the creation of applications that can build and manage OAS tag configurations and more. And of course, all tag data can be processed in real time through these interfaces, opening a world of data integrations to developers. Create custom integrations, headless data feeds, or even automate the configuration of an OAS service. Using the .NET Data Connector any C# or VB.NET application can take advantage of the OAS service. Native mobile applications for iOS and Android can be built using the OAS Portable Class Library (PCL) and Xamarin Forms. Apps can be deployed to the Apple App Store for iOS or Google Play Store for Android. Any application code capable of executing HTTP calls can communicate with an OAS service to read and write tag data, as well as read trend and alarm data. OAS server configurations can also be managed through the API. Create your own communication drivers using C# or VB.NET and define custom interface and tag properties. This SDK is easy to use and deploy and free of charge to develop unlimited numbers of drivers.